Works In Progress ... Too many to count! This week has been full of projects ... some that are getting in the way of things I really should be working on! I'm linking up at freshly pieced! I am almost done with this Ruby Baby Quilt! I'm just trying to finish hand stitching the binding! I have a TON of these blocks that I need to put together into a quilt. This is the "pogo stick" block from the Modern Blocks book. I can't decide which layout I like best. To be honest, I'm not really super excited about this quilt, the colors aren't popping like I thought they would. I just started this quilt two days ago! I have 180 HST's ready to piece together! I'm thinking about layout options for this one too! It's the week of decisions for me. Labels: HST quilt, pogo stick quilt, Ruby, w.i.p. Lucky number 236 .... Marcia, who said, "I like to see posts of your projects and tutorials on quilting." Marcia, I have emailed you so make sure you send back you contact info! Thanks to everyone who left the wonderful comments! 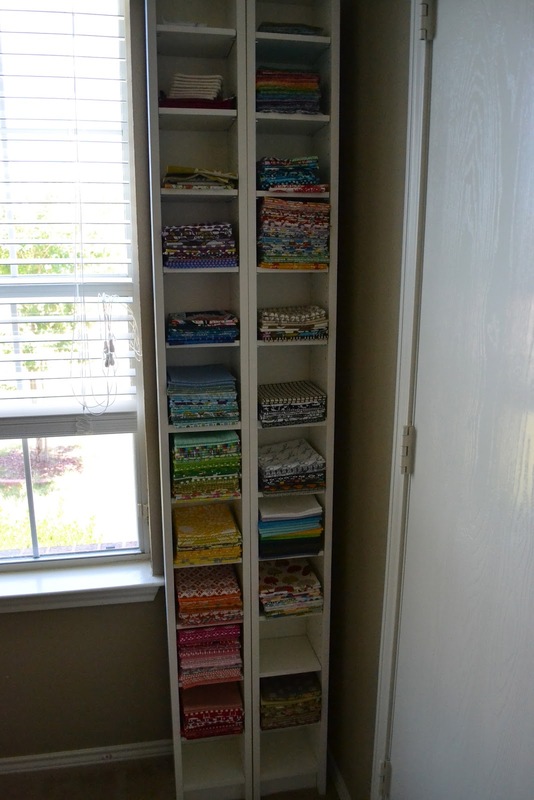 I love seeing how other people organize their sewing space, don't you?! 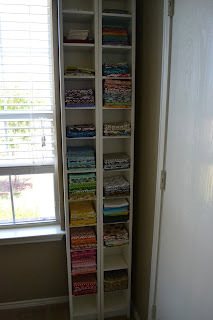 So when I saw that Karen over at Sew Many Ways is having people link up the ways they organize their thread, I had to join in! 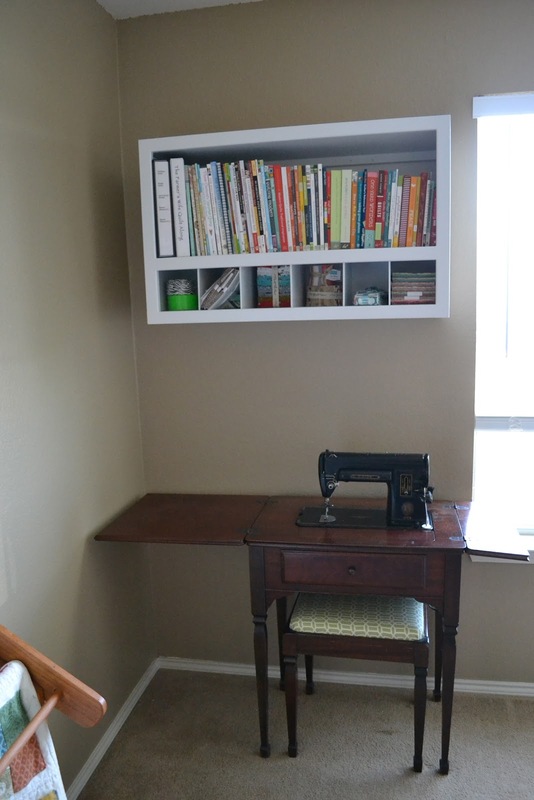 Plus, I haven't officially revealed my new sewing space!!! This was an extra bedroom but now that my parents have moved to Texas we no longer need the extra bed! So I now have my very own sewing room!!!! I keep quite a bit in that dresser! Interfacing, fusible fleece, totes, templates, fabric. My vintage Singer! And I love having all of my books in one place!! 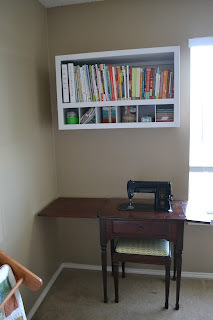 I never thought that I would have a space just for sewing! I plan to enjoy it while I have it!! I will also be linking up with Pink Chalk Fabrics ... Where I Sew Month! By the way, there's still time to enter the giveaway! I finished a Christmas project! I'm so proud! It's only July and I have finished a Christmas project! I have been wanting to make a tree skirt for over a year now and I finally focused long enough to get one finished. You might remember this lovely stack of fabrics. As much as I hated to cut into all of these beauties, it had to be done. and eventually we reached the end!!! 100th post and blogiversay! It's giveaway time! I can't believe I have been blogging for a year, and I've made it to my 100th post! This journey of learning how to sew/quilt has been awesome and being able to blog and document it all has been even better! I appreciate everyone who has shared in my adventures and has encouraged me through all of my craziness! So you know what that means, don't you? That's right .... it's giveaway time! Here's whats up for grabs! 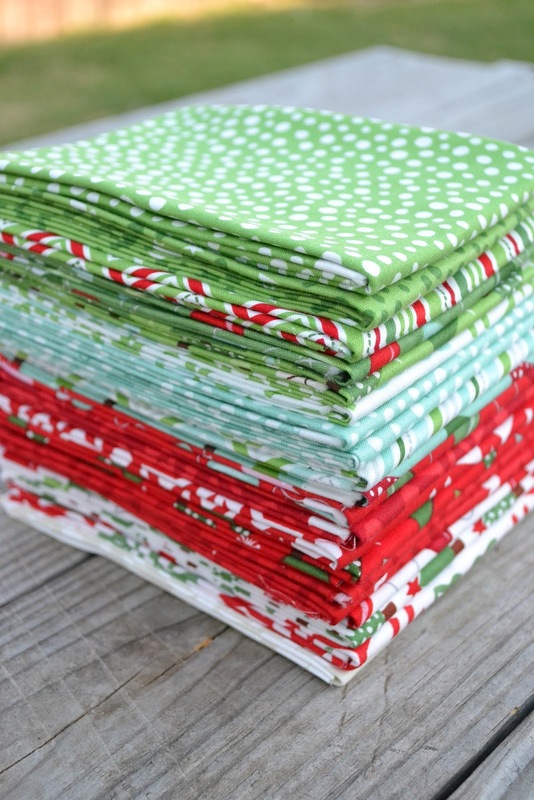 One lucky reader will win one of the new DS Quilts fat quarter panels! It's not much but it's a way for me to say thank you to all of you guys who have been riding this wave with me! And there are going to be a plethora of ways to enter this one!!! 1. Leave a comment telling me what type of post you like seeing most on a blog. 2. Become or already be a follower of my blog. 3. Follow Lori H. Designs on facebook. 5. Follow me on instagram. 6. Blog, tweet, or post on facebook about the giveaway! Leave a link so I can go check out your fun spaces! That's it! 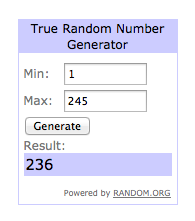 I will use the random number generator to pick our winner, and the giveaway will end on Saturday, July 21st at 8pm CST. I have just met a new blogging friend! Her name is Kate and she blogs over at Kate Michelle Designs. 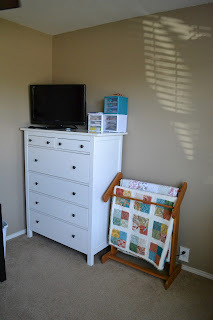 Every Tuesday she blogs about a Simple Project. Basically, when she finds a tutorial she likes, she will make the project and feature the tutorial on her blog. 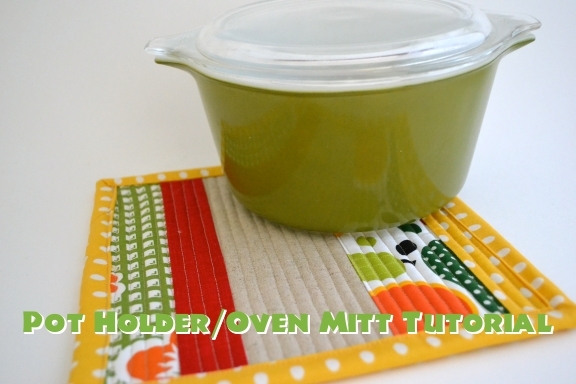 Well this Tuesday, my oven mitt/pot holder tutorial is being featured. How cool is that! So even though my wonderful readers have already seen the tutorial, you should go check out Kate and her version! My father-in-law is visiting this week and he brought an amazing quilt with him! The quilt was made by his grandmother sometime during the 1960's we believe. He mentioned he would be bringing a quilt but I never expected what he pulled out of his tote bag! Everything was done by hand! Hand pieced and hand quilted! This picture doesn't even do it justice! The colors are so vibrant and the piecing is perfect. And it makes me think. Where has this quilt been and who has it been used by? How long did this quilt take to make? Will my quilts still be around 60 years from now? Will someone appreciate the work I have put into my quilts as much as I appreciate this one? So I have come to some conclusions. I am going to embark on a huge English Paper Piecing project! I would love to have a quilt that would be considered an heirloom quilt, and I think I have the perfect fabrics for this project. This isn't a project that will get done quickly, shoot, it might take me years. I've never been one to have UFO's sit for any length of time. I am pretty systematic with how I start and finish projects. But I will put my OCD tendencies aside and start a long term "on-going" project that has no end in sight! Wish me luck! Gosh that quilt is gorgeous! Have you ever done English Paper Piecing? I would love to see pics, feel free to leave a link in your comment. If you haven't done English Paper Piecing, would a tutorial be helpful? It's been like Christmas in my mailbox this week! My wonderful mail lady, who is the mom of two of my music students, is probably wondering what in the world I am doing with all of these packages! Look at all of this goodness!!! This wonderful stack of Hope Valley came in three different packages and I'm waiting on the last two prints to finish off the collection! 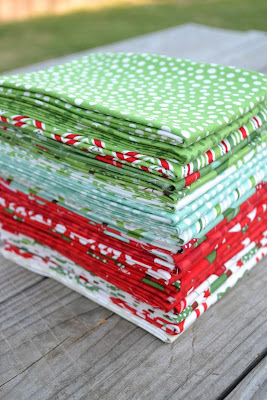 I got a great deal on the majority of these over at Pink Castle Fabrics! The sale section over there is amazing! I know I'm a little late to the Hope Valley party but I am so excited to have these beauties! I found the charm packs on sale over at Burgundy Buttons. I have ordered quite a bit of fabric from them and their service and prices are always amazing! And the jelly roll came from Missouri Star Quilt Company. It was one of their daily deals! Normally I don't purchase fabric like this but they were such great deals that I couldn't pass up! I have found my weakness, maybe I should join a 12 step program. Third Quarter Finish A Long Link Up! It's time for Quilter in the Gap's Third Quarter Finish A Long! So here are my third quarter goals! 1. I have several Christmas projects that I would like to get finished this month. The first one is a set of Christmas coasters. I absolutely love that Alexander Henry print! 2. The second Christmas project that I want to finish is a tree skirt. I am using Joy by Kate Spain for this project! I'm thinking it will be made primarily of log cabin blocks. I'm hoping to put a tutorial together for it too! 3. My LQS has had a monthly challenge with our Bring and Brag group. For the past year, we have been given two different colors and were asked to make ticker tape blocks with those colors. Well, this is the last month for the challenge and now I need to get it all put together. I have two more rows left to add and then I need to quilt and bind it. 4. I don't know if you have seen the Modern Blocks book but it's amazing! And I have joined two flickr bee's that are based off of this book. After this month, I will have all of my blocks back in my possession! So I will need to finish the quilt top, quilt and bind it! I'm not sure if I'm really going to like the look of this one but we will see. 5. I am also hoping to finish a couple of baby quilts. I used Chrysalis for the first quilt. I need to add borders, quilt, and bind this one. 6. I am also working on a baby quilt done with Ruby! I love this line and think it is perfect for a baby quilt! I need to add borders, quilt and bind this one as well. So that's six different projects to finish in the next three months! I have 5 weeks left of summer vacation so my goal is to finish most of these in the next 5 weeks! That's a lofty goal but I think I can do it! So here we go! Do you have any goals for the next few months? Have you been working on anything that you are super excited about? 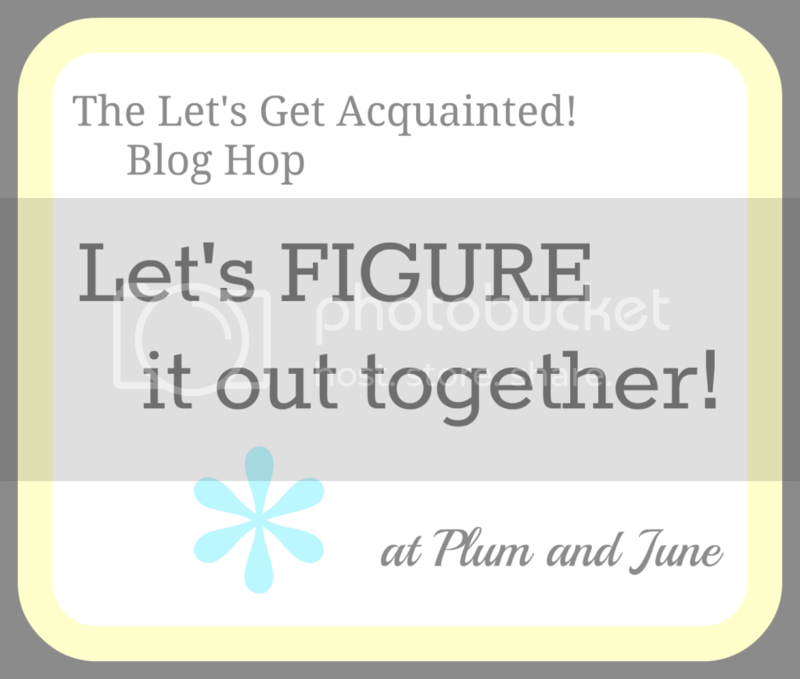 This post is part of Plum and June's Let's Figure It out Together Series with the Let's Get Acquainted Blog Hop. Beth has pulled together quite a few knowledgeable quilty folks and asked them to share their know-how on a variety of topics! So if you are looking for ways to spruce up your blog or wanting to find new social media outlets you should go check out the Let's Figure it out Together Series! So to add to all of the wonderful info available, I thought I would throw out my opinion on Instagram! I have just started using Instagram and I love it! Instagram is a free app that you can download on your smart phone; there is an app for iphones and the android operating system. Once you download the app you can create an account and start taking pics right away! Through instagram you can share photos with friends and family. Not to mention it's a great social media tool for blogging! Any photos that you take you can link up to twitter, facebook, tumblr, and flickr! It's so quick and easy, I highly suggest you go check it out! There are different photo filters that you can use to change the look of the picture. It's so much better than that regular camera on your phone! In fact, I have just started fat mum slim's photo a day challenge. Basically she gives you a list of what item to take a photo of every day! You can find out how to play here and you can see the July list here. So go get yourself an instagram account and find some people to follow! If you want, you can look me up at lorihdesigns! And if you have an account I would love to know your profile name so I can follow you! 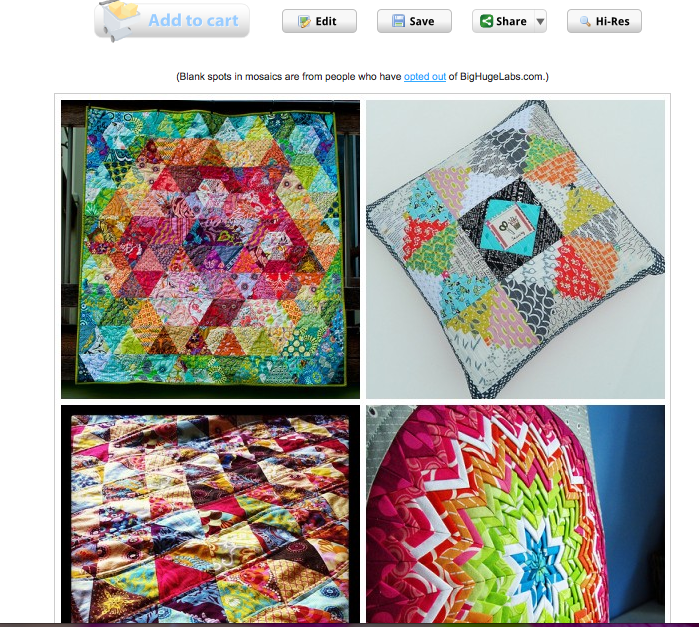 It's always fun to see what my quilty friends are up to! 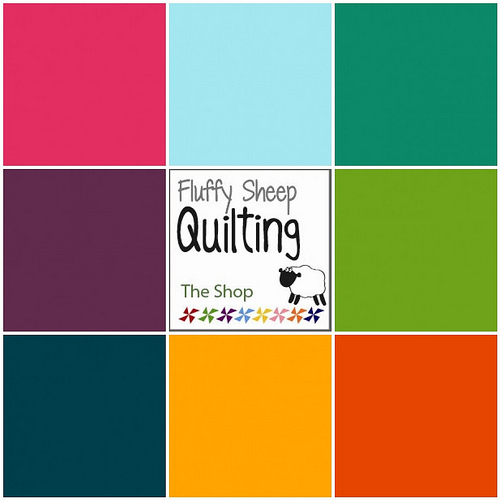 There's A Contest Over at Fluffy Sheep Quilting! Fluffy Sheep Quilting is having a contest and the deadline is tomorrow! I have no idea how I missed this but you can go to Fluffy Sheep Quilting to find out all of the info! Basically, you choose your favorite 8 Kona Solid colors that she has available in her shop and make a mosaic. Post the mosaic to her link up and the winner will be decided by a public vote! The winner will win 2 yards of their choice. And you can get it cut however you like! So 8 fat quarters or 2 yards of one color, whatever strikes your fancy! It's worth a shot ya'll! Who doesn't like the opportunity to win some fabric! So get those mosaics goin' and link up! There are so many reasons for making a mosaic! I love to make mosaics to show off the projects I have completed. I love making mosaics for swaps that I participate in. And I love making mosaics to find inspiration! Seriously, the possibilities are endless! Since I want everyone to enjoy mosaics as much as I do, I present to you .... a mosaic tutorial! My first suggestion would be that if you don't have a flickr account already ... GET ONE!!! I have gained so much from having a flickr account,not to mention all of the awesome swaps you can participate in! Alrighty ... on to the good stuff! We will be using the mosaic maker on Big Huge Labs. I find this the easiest program to use when making a mosaic. 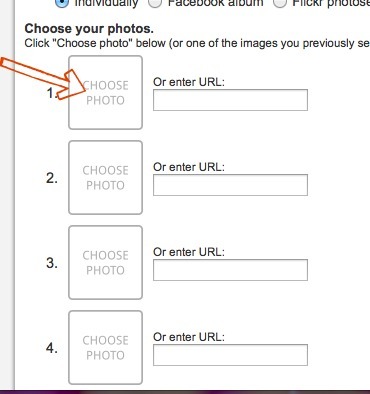 You will also need your pictures uploaded to your flickr account (if you decide not to get a flickr account, you can upload them from your computer). When you first get to the mosaic maker you will have to link your flickr account to Big Huge Labs but it will walk you through that process! 1. Go to Big Huge Labs. 2. Choose your layout. I usually use the square tiles. Figure out how many pictures you would like your mosaic to contain. 4 x 4 would mean your mosaic will have sixteen pics. I always leave my background color as white and the space between the pictures at 5 pixels. There is no need to change those unless you want to be creative. I select my images individually. 3. Click on the choose photo box. 8. You will have two options of photo sets to choose from. 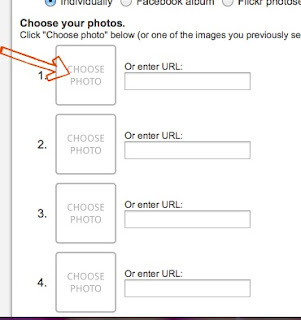 If you are wanting to show off your own personal work then you will use "photos". If you are wanting to create a mosaic of things that you love to give a partner ideas of things you like for a swap then click on "favorites". However, if you are doing a mosaic for a swap, you will need to have chosen quite a few favorites! Click on the photo that you would like to have in your mosaic! 9. Once you have chosen pictures for each of the "choose photo boxes" you can click create! 10. The Mosaic Maker will configure your chosen pictures into a mosaic and you will be directed toward this screen. 11. From here, I like to share the mosaic with my flickr photostream. 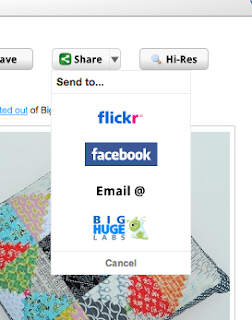 So click on Share. And then Click on flickr. 12. At this point, you can name your mosaic whatever you like. And then click upload! All of the code in the description box will show up as links to the original source. I would suggest keeping the code! 13. 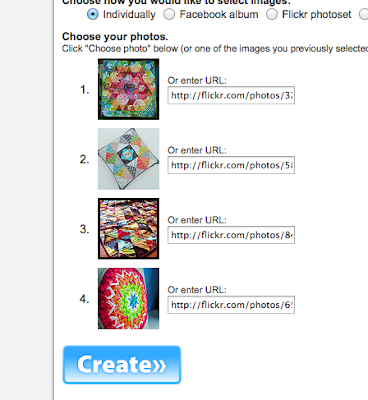 If you go look at your flick photostream, your mosaic will have magically appeared! Good luck! Beth from Plum and June will be linking this tutorial up with her Let's Figure it out together series! You should go check it out!